With the recent development of fluorescent probes and of new high-resolution microscopes (e.g., confocal, two-photon, FRET), biological imaging has grown quite sophisticated and is presently having a profound impact on the way research is being conducted in molecular biology. 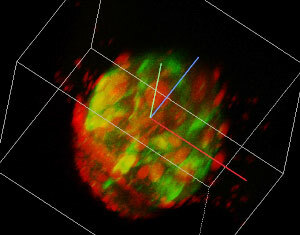 Biomedical scientists can visualize sub-cellular components and processes, both structurally and functionally, in two or three dimensions, at different wavelengths (spectroscopy), and can perform time-lapse imaging to investigate cellular dynamics. 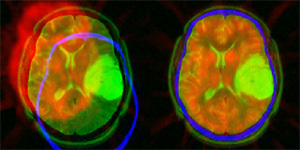 The data analysis and processing techniques that are currently used in the field, however, are still relatively crude if one compares them with the state-of-the art in medical imaging. This motivates our present research effort which is to develop novel image-processing techniques to improve the quality of these images, to enhance specific features (e.g., spots, filaments), and to extract quantitative measurements from the data. modeling of the acquisition process: optical system (2D or 3D point-spread function), noise (photon-limited). the necessity for a careful validation of algorithms on clinical cases. This last point is crucial if one wants to have an impact on the field. The current focus of our research is the interpolation of medical images, image reconstruction, 3D visualization, various types of image registration (e.g., intra- or inter-modal, elastic, 2D/3D), wavelet-based techniques, and motion estimation from echocardiograms. Our greatest impact so far has been the introduction of the spline methodology in medical imaging: Some of our high-quality interpolation algorithms have been incorporated in standard imaging software such as SPM.